The wind industry was founded on myth, is built on lies and runs on a mix of subsidies and propaganda. And, it should never be forgotten that, the greatest economic and environmental fraud of all time, was only made possible by our political betters. Armed with the belief (not unjustified) that you can fool most of the people, most of the time, politicians run the same nonsensical lines as the rent-seekers, who critically depend upon them for endless subsidies, mandated targets, tax credits, soft loans and corrupt planning rules and regulations. It’s a match made in heaven. One of the bigger furphies is that wind power ‘competes’ with coal-fired power. ‘Competition’ means a head-to-head race between all competitors, starting at the same time and traversing the same course, from start to finish. Not so with wind power. 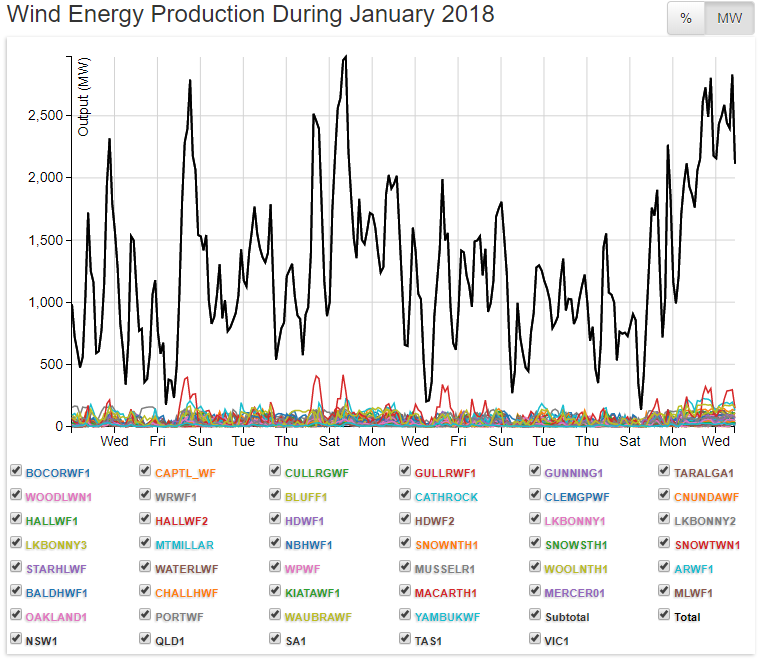 See above the output from every wind turbine connected to Australia’s Eastern Grid, with a combined notional capacity of 4,360 MW, during January, courtesy of Aneroid Energy. When wind power output collapses in minutes, without warning, in magnitudes of 1,000-2,000 MW it’s hardly ‘competing’ with any conventional power generation source, especially coal-fired power. Although a generous track Marshall might mark it down for a DNF for its inability to cross the line with the rest of field, rather than disqualifying it from any further such ‘competition’. Another line being peddled furiously at present is that Australia will never build another coal-fired power plant, because private investors and banks won’t stump up the cash needed to build any new capacity. The trouble with that argument is that private investors have never built any baseload power generation capacity (whether running on coal or gas) in Australia. Every coal-fired power plant built in this Country was built by a State government and underwritten by taxpayers. When States like South Australia, Victoria and New South Wales blew their budgets, starting with SA’s State Bank collapse in 1991, state-owned generating capacity was flogged off, in many cases for peanuts, to help balance the books. Outfits like AGL snapped up the 2,000 MW Liddell and 2,640 MW Bayswater from the NSW government in 2014 for a song, and have used them, along with their very substantial coal-fired generation assets to book record profits; despite their posturing about getting out of coal, AGL generates around 85% of the power it sells using the ‘filthy’ black stuff. The idea that Australia is going to allow its ageing baseload generators to go the way of the Tasmanian Tiger, is ludicrous. Wind power will never displace, let alone replace, coal-fired power in this Country; coal presently satisfies 85% of Australia’s electricity demand, and that ratio isn’t about to change, anytime soon. Feverish talk from renewables rent seekers and politicians about giant batteries and pumped hydro being ‘game changers’, that will soon allow us to run entirely on the weather, is two parts fantasy and three parts desperation. Meanwhile, back on terra firma, here’s Alan Moran, once again pricking the renewables rent-seeker’s bubble. Nobody should believe what any Australian government minister tells them about energy. Influencing politicians are self-interested lobbyists, and voters who have fallen for green falsehoods that the coal fired power station that supply four fifths of our electricity are dirty and no longer needed. Many politicians have themselves drunk deeply from that Kool Aid. Their policies have led the nation into an abyss of high electricity and gas prices, with uncertain reliability. A few years ago Australia had the world’s cheapest electricity and low cost gas. But Government programs stacked the deck against cheap coal-generated electricity and prevented the search for and development of new gas supplies. We have just gone through two weeks of a conventional summer and, while the electricity supply had only minor outages, prices have doubled. That’s what happens when supply is reduced. The current crisis of high electricity prices and supply shortages stems from the closures of Hazelwood Power Station in Victoria and the Northern Power Station in South Australia. The Andrews and Weatherill State Governments assured us that those closures would make no difference to power security and bring only a small increase to the price of electricity. Commonwealth Energy Minister Frydenberg said Hazelwood’s closure would cost the average Victorian consumers $86 per annum. But that is massively short of the mark – once wholesale energy costs are passed-on the average impact will approach $500 and business users will pay far more. Meanwhile the Victorian and South Australian governments are busily subsidising new wind, solar, and batteries, and asking consumers to reduce their energy use, while spouting lies that prices will eventually fall. The Commonwealth blames state governments but it has been equally guilty. Labor’s hostility to coal power, the backbone of Australia’s electricity supply, has been only part of the reason for the disaster that has been created. The key instruments destroying the economics of the electricity industry are Commonwealth and State subsidies to renewables, subsidies that destroy the economics of coal and gas generators. The Liberals initiated the Commonwealth’s subsidies, though the Rudd/Gillard government massively expanded them. Last year, governments’ electricity subsidies and regulations cost $5 billion. That’s $600 for every household. But the costs don’t stop there. The market distortions have brought vast spending on new wind and solar facilities – $11 billion in 2017 alone. That spending bankrupts commercial plant like Hazelwood and higher prices follow. Far from contributing to income, the renewable energy subsidies bring wealth reductions – they are just as destructive as government grants to foster spending on the creation of computer viruses. Government sabotage of the gas supply industry is hardly less serious. In this case the blame rests squarely with state governments, Labor and the Coalition alike. The Victorian Coalition banned all gas exploration. They justified this on spurious safety grounds with regard to fracking, even though expert advice gave fracking technology a clean bill of health and we had the experience of two million such wells in the US alone without adverse incidents. The Andrews government has gone even further in denying consumers cheaper gas by proclaiming it is, “Banning fracking once and for all”. The outcome: Victoria with immense gas reserves now sees consumers with the highest prices in Australia. Surely we deserve better political leaders. I’m impressed with the Green commitment. The German, South Australian and Victorian love affairs with wind and solar are falling in conspicuous heaps, but it doesn’t stop the Greens and sympathetic politicians trying to rush every other federal, state and regional administration down the same rabbit hole as fast as they can. I reside in the USA and the push by (predominately) Democrat-leaning activists and environmentalists is as strong as ever. The obvious examples of the Germans and the crow eaters means nothing. They’re ignored. The Greens are more than happy implementing exactly the same policies Worldwide hoping either for a different outcome or perhaps more realistically: if the policies are implemented hurriedly, that the economies will be in complete irreversible recession before the majority of the population wakes up to the damage. As an Australian citizen who resides in Germany, I badly need to put my take on this. I am deeply saddened at the current state Australia, my country, is in. Sadly, my older brother, who lives in Australia, still buys into the green megalomaniacal bigotry. The energy issues that Australia is facing at the moment, were done by design. This clearly demonstrates, that because of excess amounts of bureaucracy, that were introduced and enforced from roughly 1910 (before World War I) to today, along with government’s price fixing of resources, that amounts of the latter were being squandered. If anyone shows at least a little bit of understanding, he or she will know that prices usually show what resources are either scarce or plentiful. Price fixing by governments erroneously distorted those sound facts. That is known as the Economic Calculation Problem. In addition, the introduction of the Australian Competition and Consumer Commission and the Department of the Environment and Energy along with the these bureaucratic emissions caps (under the guise of the hoax known as man-made climate change. Climate change is natural and is only driven by the sun.) and the bureaucratic hurdles, have stopped cheaper competitors from entering the marketplace, and have subsequently lead energy prices becoming excessively expensive. There’s no reason to be surprised about that. 1) Abolish all energy related laws, legislation, acts and emissions caps, which were introduced and enforced from 100+ years ago to today! 2) Completely withdraw from the Paris climate accord and the United Nations! OZZEXIT / AUSEXIT ! 3) Shut down and dissolve both the Australian Competition and Consumer Commission and the Department of the Environment and Energy and replace them with absolutely NOTHING at all! 4) Scrap and reject all Emissions Trading Schemes, taxes and suchlike! 5) Eliminate and nullify ALL energy related subsidies! Leave energy issues to the private sector ONLY! Issues such as those are none of government’s business. 6) Completely PRIVATISE the energy sector! 7) Re-open the closed coal mines! 8) Re-activate, even upgrade coal-fired power plants and build new ones to ensure that they generate as much energy as possible, whilst using as little resources as possible and only releasing two gases, which are essential for survival (especially for plants and crops): water vapor (H2O) and carbon dioxide (CO2). CO2 is a NUTRIENT! 9) Give fracking the green light! It isn’t as deadly as many eroneously claim. I suggest watching the documentary “FrackNation” with an open mind. 10) Every single option to generate energy should be on the table. None of them should be excluded. As recorded history has always proven, government is only good in wasting other people’s money. It is time to let the markets / the private sector take care of these issues! Speaking of markets, have people ever asked themselves who the markets actually are? Here’s the answer: We the people are the markets. Therefore, there is obviously a demand for a clean environment. How can that demand be achieved and sustained? Easy: By using your own resources wisely and defending private property rights. Capitalism is the voluntary exchange of goods and services. What we have today isn’t capitalism, but corporatism (economic fascism). Corporatism is by definition the merger of state and corporate powers. Corporatism/Fascism, just like nazism, is a subset of the democidal cancer called socialism and is therefore left wing only. Corporatists, who hate competition, always rely on government to survive, and since they receive subsidies and bailouts by government (at the expense of the tax payers), they waste resources. Now then, for those who still (voluntarily) want solar panels on their rooves, go ahead, so long it isn’t funded at the expense of the tax payer. Each to their own. The origins of the present can be found in the past. In other words, in order to find answers and root causes to today’s problems, we need to really delve deep into the (distant) past. My comment does exactly that. By ignoring the past, we literally embrace ostrichism / denial of reality in an erroneous and willful manner. Karl, thanks for your comment, we have posts coming up about the disaster in Germany, we would be pleased to get your observations from a German resident’s perspective. “Capitalism is the voluntary exchange of goods and services. What we have today isn’t capitalism, but corporatism (economic fascism). Corporatism is by definition the merger of state and corporate powers. Corporatism/Fascism, just like nazism, is a subset of the democidal cancer called socialism and is therefore left wing only. Corporatists, who hate competition, always rely on government to survive, and since they receive subsidies and bailouts by government (at the expense of the tax payers), they waste resources”. That sums things up precisely. Unfortunately in Australia the politicians of the two major political parties have allowed themselves to be bought by the Renewables lobby – discreetly, mind you – but bought & paid for all the same. The result is that they will not stand up to the Greens, who are the de-facto puppeteers of many aspects of Australian politics. When the Greens start to scream and shout on a particular policy issue then the marginal MPs of both major parties (but particularly the Liberal Party), immediately tremble in fear and in-effect go part of the way to submitting to the Greens policies. The academic class and the people who control the government-owned science-based instrumentalities such as the Bureau of Meteorology and the CSIRO have dumped the application of empirical science as a worthwhile principle and have sold their souls in Faustian bargains in the service of climate change falsehood. The Australian Academy of Science is nothing but a joke – the main science that the preening, posturing, self-congratulating spivs of that institution seem to underwrite is the alchemy of extracting money from climate change alarmism – which ultimately means stealing from the poor of Australia – who increasingly cannot afford to heat their homes in winter or cool them at the height of summer. As Australia’s industries gradually collapse due to the obscene artificial cost of power, air-conditioned shopping centres are filling-up with pensioners and underemployed citizens trying to escape the summer heat but unable to afford to buy much of what those centres offer. The priviliged members of the Australian Academy of Science are underwriting unscientific policies supporting the climate change wealth-transfer juggernaut that are resulting in the deliberate impoverishment of ordinary Australians. It really does stink. In the course of time, all these pseudo-scientific phonies will pay a price for promoting their climate change alarmism falsehoods because eventually the chickens will come home to roost – but that seems a long way off. The way the Westminster system works there is no way of altering this situation short of a major crisis taking hold of the Australian economy – but that is always a possibility because the negative variables are stacking-up. A pox on all their houses.